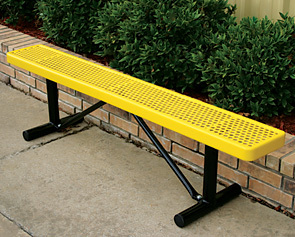 This UltraLeisure™ Series perforated steel bench features abrasion and corrosion resistant, extremely durable thermoplastic coating at an a ultra-low price! Same high-quality materials and construction with only slightly less steel at a more economical price. This park bench is offered in your choice of portable, in-ground or surface mount. Made with #11 gauge 3/4"Hole perforated steel and heavy-duty 2-3/8" O.D. heavy steel tubing legs. 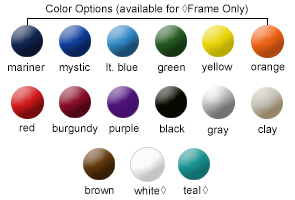 This UltraLeisure™ Series park bench with a lightly textured Polyethylene finish, and the frames are powder-coated in a variety of colors.